There are many techniques that can help you detect negative energies in your home. Today we’re going to show you the simplest one which will clean negative energies from your home and maintain the harmony in your family. We inhabit certain energies wherever we live. Our homes are a space of unity where many energies meet – our feelings, thoughts and emotions emit a certain type of energy, but also attract other energies. Family members, neighbors or visitors in our homes can bring in negative energies which may affect our well-being. Once they enter our home, negative energies impact our whole life. They can cause our budget to fluctuate, break the relationships between family members and disrupt the harmony in our home. As a result, you will feel anxious, restless and broken, with no will to live. However, the symptoms may not be noticeable early, which is why it’s important to know how to detect the negative energy in your home. Get a clear glass and pour sea salt in it – it should cover about a third of the glass. Top the glass off with water, then put it in the room where you think the bad vibes are most powerful. Put the glass in a hidden spot and leave it for a full day. Make sure no one moves it from the spot. After 24 hours, examine the glass – if it’s just like you left it, there are no negative energies in that room. You can try the trick in another room and see what happens. 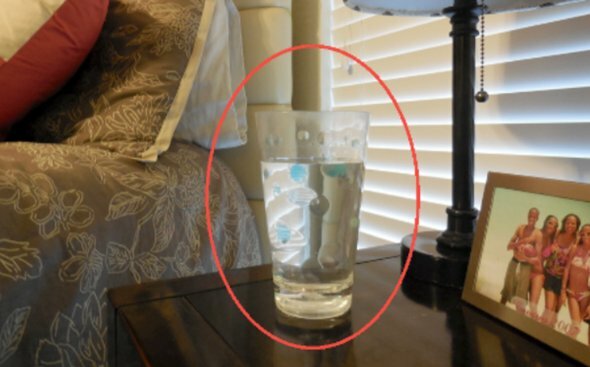 If the glass has smudges and is clearly not like you left it, it is a result of energy problems. In this case, repeat the procedure again with a new glass, and repeat until it’s as clean as you left it.